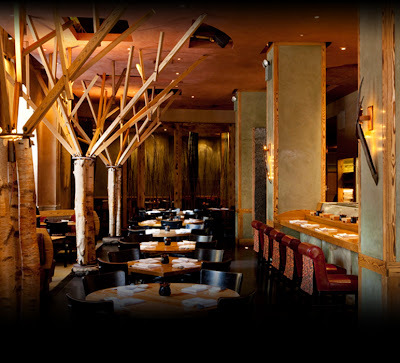 Around 1996, my dad and I dined at the famous Japanese restaurant, Nobu, in NYC's TriBeCa. Back then, it wasn't common practice for me to visit upscale restaurants. I was still a teenager and this was a big event for me, one prompted by the fact that Dad had received a gift certificate there from my brother and sister in law. 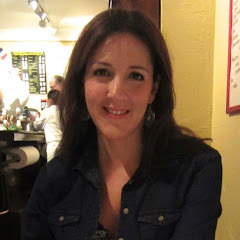 To my delight, he chose to take me as his dinner guest, his little sushi fiend. Earlier that year, he had also introduced me to the wonder that is sushi. On weekends, during my visits to his house in New Jersey, our ritual was to hit the Asian supermarket in Edgewater and come back with trays and trays of takeout sushi. I got hooked. Like me, Dad was also someone who relished a good nap, so the best part about our weekly sushi binges was that afterwards, we'd both fall into what we called a "sushi coma" on the couches in front of the TV. Those were good times. Overall, Dad and I shared a lot of the same traits with regard to food. He was the type that would become fixated with one food item and eat it every day for several months. The subjects of his obsessions ranged from things as simple as Dannon Coffee Yogurt and Del Monte "Very Cherry" Fruit Salad, to Alaskan King Crab Legs that he'd buy by the pound from Costco. The guy knew how to live it up and eat well, and he did everything to the max. If you ask anyone who knows me, they'll tell you I go through the same sort of food jags. Currently it's Guy and Gallard's Chicken and Dumpling Soup for lunch. In college, I ate a toasted bagel with one slice of melted cheese, a tomato, and hot sauce. This was my favorite lunch for four years running. In high school, the subject of my desire for a solid year was a slice cheese cake from our cafeteria. 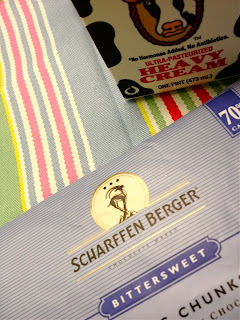 Astonishingly, I gained not one pound from this everyday indulgence, though I can't look at cheese cake to this day. Cheers to teenage metabolism, I guess! Those days too, are long gone. Naturally, when our big night at Nobu rolled around, I was a totally fixated on ordering sushi and had zero interest in anything else they served. In my single minded quest, I nearly missed one of the best things they offered on their menu - the Miso Glazed Black Cod. On the waiter's recommendation, my dad requested it. Black Cod, unlike other cod varieties, is truly the Cadillac of fish. It has a luscious, buttery texture and a delicate flavor. With a little nudge of the fork, it flakes off easily into silky, perfectly symmetrical segments. It's a beautiful fish that should be eaten slowly and thoughtfully. Miso pairs with it naturally. Once Dad's cod arrived, I still turned up my nose when he offered me a bite, but when I finally agreed to taste it, boy was I glad. 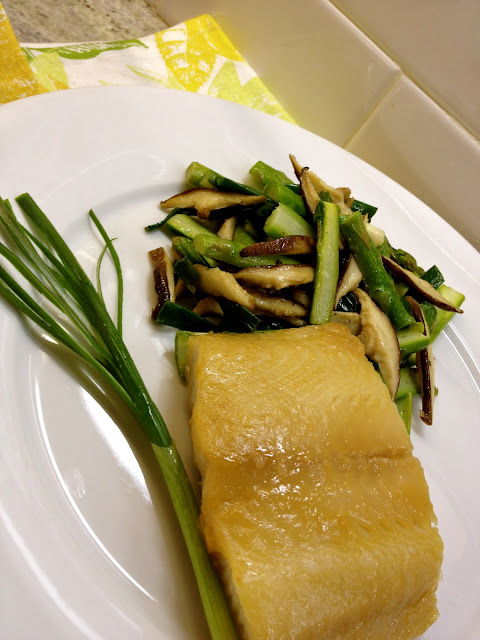 Now that I cook regularly, I thought it might be nice to find a Miso Cod recipe in order to recreate this special memory. While the authentic Nobu recipe is available online HERE. The recipe I ultimately adapted is from Food.Com and tastes the same. I find it easier too, though they don't differ all that much. The recipe I've provided below is worthy of food addiction. Though black cod comes with a steep price tag, this dish is totally worth it. It's also easy enough for a weeknight dinner (both the main course and the vegetable side can be made in under a half hour, not counting five minutes to prepare the cod marinade the night before), but because it is so tasty and elegant, it's also a great dinner party choice. Dad passed away in 2005 and I miss him every day. Yet, I feel blessed that I have lots of great memories to draw on, and enumerable traits in myself that remind me of him. Do enjoy this easy and tasty version of the Nobu classic (and the suggested veggie side), and I hope that you too have great memories of family and food. In a large skillet, heat oil over high heat. Add mushrooms and cook, tossing frequently, until browned. About 10 minutes. Meanwhile, boil 3 Cups of Salted Water in a small saucepan. Add Asparagus and cook for about 3 minutes until crisp yet tender. Drain. To Mushrooms, add Asparagus and Scallions. Cook, tossing frequently, until pan is dry and scallions have wilted. About 2 minutes. Add vinegar and serve immediately. Recipe Adapted from Food.com's "Chef at Large"
Combine Miso, Mirin, Sake, Soy and Maple Syrup in a small pot over low heat. Mix ingredients until smooth and incorporated, about 5 minutes. Let the mixture cool and pour it over the cod in a container to marinate in the refrigerator for 24 hours or more. Set oven racks in the middle of the oven and one in the broiler position. Remove fish from the marinade and scrape off as much as you can. Place fish on the middle rack on a baking sheet and bake for 5 minutes. Turn on broiler and move fish to broiler position. Broil another 2-3 minutes so that the top browns and glazes a bit. Remove and serve immediately with a bit of rice and optional pickled ginger. My husband and I recently enjoyed a brief ski weekend away with three other couples at a gorgeous lake house up in Adirondack, NY. As is often the case when we spend time with great friends, there was lots of eating and imbibing, laughter, and other hijinks. Our rental house not only had gorgeous panoramic views of Schroon Lake, but also the most amazing chef's kitchen I've ever seen up close - it even came complete with a chef's jacket and funny cook's hat that made for some very amusing photo ops as the nights, and drinks, wore on. Another couple brought up a fresh suckling pig from a butcher in NYC that they basted with oil and slow roasted until it emerged from the oven extremely juicy and delicious. As you can see, it was also quite popular. As if all these dishes weren't enough, we were then treated to a home-baked chocolate bundt cake which was made even more delectable by the addition of Jameson Irish whiskey. Apparently we find ways to get alcohol into everything! Our weekend was a smashing success and we did tons of fun activities including skiing and even an impromptu trip to an Alpaca farm (these guys are really friendly and adorable). During the four-hour ride home, I found myself craving vegetables. I just wanted something light and reasonably nutritious to erase the culinary (and cocktail-fueled) overindulgences we'd engaged in for the past three days. When I think food detox my mind jumps to vegetarian fare, and after searching for meatless entree ideas (on my sluggish Blackberry in slow traffic on the Thruway), I came across a fast and easy yet untraditional Moo Shu recipe. This vegetarian version omits the usual pork and substitutes whole wheat tortillas for the traditional pancake wrappers. Since I had a lot of time on my hands, I reasoned that somehow this would be less filling if instead of using a bunch of tortillas, I made this into more of a noodle dish with just a small portion of soba noodles (made of buckwheat). Yeah, buckwheat sounded wholesome to me in my weakened state. As the original Vegetable Moo Shu recipe on Eatingwell.com suggests, buying ready-chopped veggies such as broccoli slaw really does cut down prep time significantly. Below is my adaptation of their recipe. You have the option of using whole wheat tortillas for a play on traditional Moo Shu pancakes, or mixing in a modest portion of noodles or even brown rice as your carb addition instead. I am sure I will be making the real thing one of these days! ~If using the Soba Noodle version, set a medium pot of water to boil. Once boiling, add noodles and cook, stirring occasionally for 4 minutes. Drain and set aside. You may have to loosen the noodles with water before serving. ~If serving in "pancakes," set aside 12 small tortillas and heat them just before serving veggies. Diners can fill their own pancakes and top with extra Hoisin sauce served alongside. Heat 1 teaspoon of the sesame oil in a large non-stick skillet or Wok over medium high heat. Add the eggs as you would if making an omelette and cook them until they are set, 3-4 min. Remove egg pancake to a plate. Wipe out the pan and heat the remaining two teaspoons of sesame oil over medium heat and add the ginger and garlic. Cook, stirring often, until softened and fragrant, about 1 min. Add the shredded veggies, bean sprouts, half the sliced scallions, soy sauce, and vinegar. Stir and cover, stirring again once or twice, until the veggies become crisp tender, about 3 min. Meanwhile, slice your egg pancake into thin strips and slice the strips once again down the middle. Add the chopped egg and Hoisin sauce to the skillet and toss until heated through, about another 1 to 2 min. Stir in the remaining scallions and remove from the heat. Place a small portion of Soba Noodles on a plate and add the veggies on top. For the pancake option, serve heated tortillas and allow diners to fill the pancakes with the veggie mixture themselves. Serve with extra Hoisin. Valentines Day, oh how you change from year to year. As a single, V Day was a dreaded event, a day I was certain that Hallmark created to terrorize and depress me. For every bouquet of flowers delivered to the office, I'd sigh a long hushed groan. It was back then I decided that Valentines day need not be a holiday exclusively for romantic love. Instead, it could be a day to celebrate love of all kinds. Over the years, I've made Valentines meals for my mom and marked the day by going out to dinner with my girlfriends (Anti Valentines Day, anyone?). One year I enjoyed spending a great deal of time making little edible gifts for each one of my coworkers, and another year I spent a very nice evening with some tasty takeout and my cat. He's cute, right? Even now, I still never forget those single days, and I stand firm in the belief that Valentines Day should be a time to express any kind of love that fits best in your life - be it familial love, romantic love, friend love or even just doing something nice for your very own self. 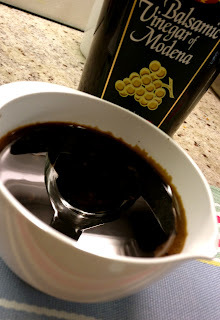 It's no secret that I think cooking a meal is great way to express affection, so this year, with Valentines day being on a Tuesday, I thought it might be nice to try to create a relatively quick yet still special multi-course meal for the Mister. With the suggested make ahead components and prep the night before, this meal will take an hour to an hour and fifteen minutes to prepare - not bad for an impressive 3 course spread. It is in this expeditious spirit that I give you: Valentines Quickie. Blanch basil in boiling water for about 10 seconds. Pat dry and add basil to blender or mini food chopper. Add the oil and puree until mixture is smooth. Storage - This can be stored in the fridge up to three days. Let stand at room temperature 30 minutes before using. Fast yet special weeknight meals get that way with a little bit of prep work in advance. The night before, Marinate your lamb in oil (see step one of recipe), and wash all fruits and vegetables so they are ready to go the day of. You'll have also made your balsamic reduction and basil oil up to 3 days before. If you did, well done! For our fast and easy first course, I decided on a tomato stack layered with delicious fresh goat ricotta I bought from Coach Farm. For our tomato component, I tried out a special tomato variety called the Kumato. Kumatos range in color from brown to brownish green. They are on the smaller side, and perfectly round. 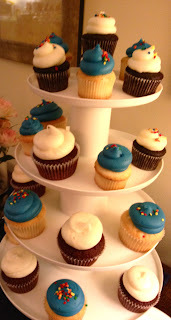 They are purported to be sweeter and more complex in taste. I snuck a piece while preparing my napoleon and definitely tasted a difference. Nothing will ever beat a Jersey Beefsteak in the summer, but during the cold months when tomatoes can be unreliable, the Kumato is a great go to. They are also kind of cool and heirloom-y looking. I know what you're thinking - these aren't some weird freak of science, nor are the genetically modified. For more info on this funky brown tomato, check out their slick PR on www.kumato.com ! Goat Ricotta can be dry, so add milk to it a dash at a time in a small bowl. Give it a mix until it reaches your desired consistency. Somewhere between runny and dry will be ideal. Skip this step if using regular ricotta. Mix in salt and pepper to taste, feeling free to add any extra spices you may fancy. Place one tomato round in the middle of each serving dish. Top with a smear of Ricotta, a dash of basil oil and a drop of balsamic reduction. Repeat this process until you've built a stack about 2 inches high. 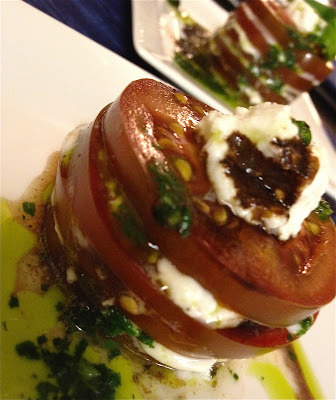 Finish the top off with a dollop of ricotta, a few sprigs of basil, and a drizzle of balsamic and basil oil. Add a little more salt and fresh cracked pepper and enjoy! In our house, Lamb is a special occasion food, and there's nothing like a beautiful frenched rack of lamb. We like ours nicely medium rare. Lamb is one of the most forgiving meats to cook because it always seems to come out delicious, even if slightly overcooked. I opted for a simple preparation for our lamb rack because I would be glazing it with a yummy cherry pan sauce with lots of flavor. The night before: combine the olive oil, crushed garlic, rosemary, and salt and pepper to taste in a gallon Ziploc bag. Place whole rack in the bag, and squish around until oil and ingredients have covered the lamb. Refrigerate over night. Remove Lamb an hour before and let sit at room temperature. Take Lamb out of bag, scrape off herbs, and pat dry with paper towel. Heat a large oven safe skillet on the stove top with a tablespoon of olive oil. Place whole rack in the pan and brown on both top and bottom, about 2-3 minutes per side. Move skillet to oven and cook about 20 - 25 minutes for medium rare. We cooked it for 23 minutes and it was perfectly medium rare after resting. A thermometer should register about 130 degrees. Remove Lamb to platter and cover tightly on all sides with foil. Let rest for 10 or 15 minutes before carving chops by cutting between the bone and serving. If you hit bone while cutting, wiggle your knife a bit. 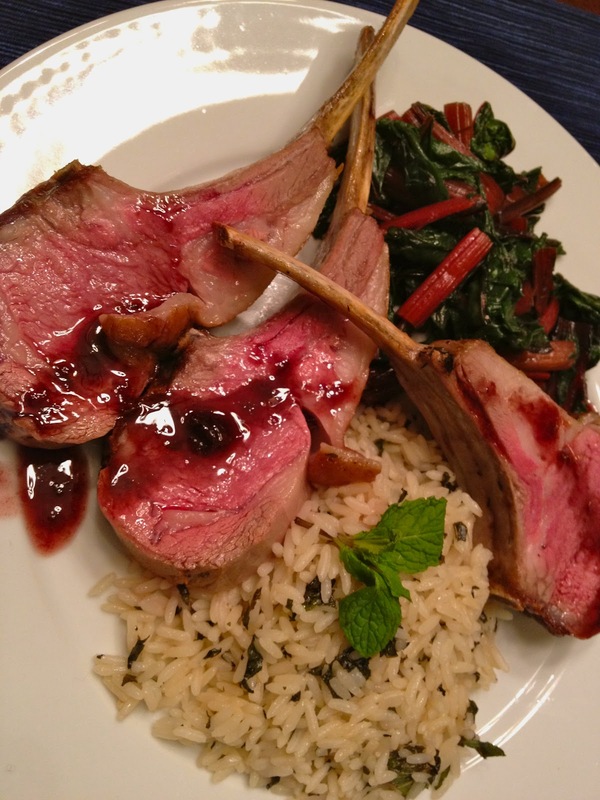 Once Lamb is in the oven, prepare your rice ingredients by chopping the mint and taking the butter out of the fridge. You can heat up your rice as directed just a few minutes before you are ready to serve the whole meal, or even after the whole rest of the meal has been plated. The prep of this dish literally takes two minutes when you use the Uncle Ben's Ready Rice, which, by the way, has become my new best friend in the kitchen. Heat rice as directed for 90 seconds in the microwave. Pour rice carefully into a medium prep bowl and mix in butter, mint, and salt and pepper to taste. Serve immediately. Once Lamb is removed from skillet and resting on your platter, drain off nearly all the oil and drippings from the skillet, leaving only about a tablespoon. Carefully add the wine (it can flame up) and allow liquid to come to a gentle bubble as you use a wooden spatula to scrape off the brown bits from the bottom of the pan. Allow liquid to reduce a bit and lower the heat to a simmer. Add the cherry preserve, and mix in until incorporated. Any remaining cherry chunks are just fine. You can choose to strain them out later or leave them in the sauce. Continue to heat pan sauce for a few more minutes until it thickens just a bit. Add a good pinch of salt and a tiny pinch of pepper. Stir.Turn off the flame and let sit a minute or two. Add a tablespoon of butter and stir until melted. Pour your sauce on top of the lamb before serving and serve extra in a pouring vessel for those who want extra pan sauce. Swiss Chard is a favorite in our house. I chose the red variety for Valentine's Day because the stalks are so vibrant and pretty - they look just like rhubarb. My girl Martha (Stewart, that is- in my dreams we're on a first name basis) recommends chopping the stalks and cooking them first because they are tougher than the leaves. Who am I to argue? Prepare your veggie course right after you set your lamb out to rest - you'll be working the pan sauce at the same time, so keep your wits about you and don't drink too much pre-dinner wine. The chard takes about 10 minutes to cook. You can DO it! 1 bunch Red Swiss Chard, stalks removed and chopped into one inch pieces, leaves torn into 2 inch pieces. In a large skillet, heat oil over a medium flame. Add the stalks, tossing, for 4 minutes until crisp yet still tender. Add the chard leaves. If they do not all fit in the pot, wait for them to wilt a bit so more room is made. Season with salt and pepper and cook, stirring once in a while, for an additional 4 to 6 minutes. Remove skillet from heat and discard any liquid. Stir in Lemon Juice and season with salt and pepper. Set on the plate to serve immediately. Ok, by now you're like: Sam, whaddya mean this is a quick-ish weeknight meal? Now I have to make dessert too? Here's where you enlist some help. Whoever you are cooking for, be it a friend, your honey, the 'rents, or your cat, have them join you in the kitchen. 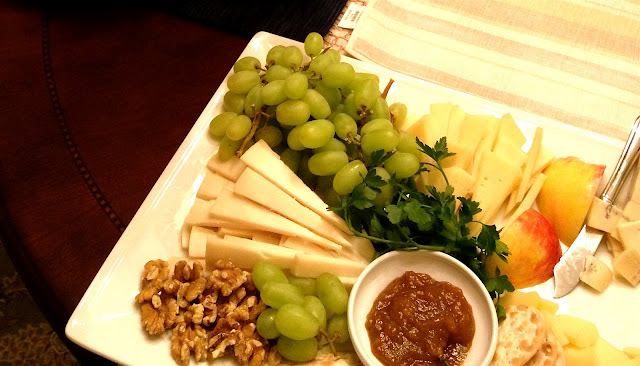 If your guest has opposable thumbs, they should be helping you assemble your fondue fruit kebabs. 2 kebabs per person should do it. When your colorful skewers are good to go, zap your chocolate sauce and get dippin'! Combine chocolate and cream in a heat safe bowl set over a pan of barely simmering water. Stir periodically until chocolate is fully melted and the mixture is smooth. Combine ingredients in a microwave safe bowl and heat in 30 second intervals, stirring, until mixture is smooth. Pour chocolate into individual or communal bowl and serve immediately alongside Skewers of Assorted Fruit. We used: Strawberries, Pineapple, and Raspberries. Marshmallows make a fun addition too! Enjoy with love from Neurotic Kitchen! This year’s Superbowl fete included a whole lotta food, too much drink, and a win by the Giants. What could be better? Well, for starters, I should’ve had the foresight to take the next day off today to recover from my food coma, but I digress. The Superbowl is one of many days where Americans feel at liberty to be gluttonous and stuff their faces with mass quantities of the unhealthiest foods possible. We are no exception, so as I planned the party menu to be served to some of my husband's local friends, we chose all the usual suspects, both store bought and homemade: wings, chips and pico de gallo, meatball subs, loads of cheese and cured meats, focaccia pizza and cupcakes for dessert with Giants colored icing, natch. Thanks to my local cupcake shop, there was no baking required. But rather than go deep into what was a tasty spread, I’d like to instead share two of our favorite offerings that were extra well received. 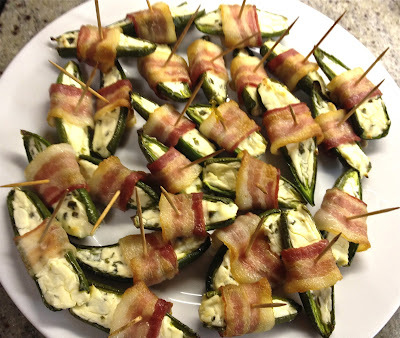 There are numerous recipes out there for Jalapeno Poppers. These ubiquitous bites of spicy goodness come in all varieties, from deep fried to ooey-gooey cheese-filled - or both. I try not to deep fry too often because it makes a mess and it usually has to be done right before serving to avoid mushiness. The recipe below, adapted from recipes I've seen over the years, is so easy and simple and works with nearly any cream cheese-based filling. These poppers can be assembled ahead of time and put in the oven when guests arrive. Don't fear the Jalapeno heat. The cheese filling mellows the spiciness of the peppers, which also get a bit less fiery in the cooking process. Bacon, the king of meats (according to most men I know) is an addition that makes these poppers a sure hit. My husband is a very loyal bacon devotee. 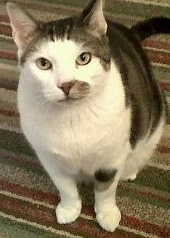 In fact, my mom refers to him as “Bacon Boy” on a regular basis. Since bacon eating was practically a prerequisite for dating him, I've tried to at least limit our intake to once every two weeks or so. But after the way we gorged on these Bacon Jalapeno Poppers last night, we’re probably good for the next few months. A dozen medium to large sized green Jalapenos, sliced lengthwise and cleaned of ribs and seeds. Tip: Using a knife to detach the white membrane on each end and then dragging a small spoon down the middle works well to de-seed. And for the love of god, don’t touch your eyes for the rest of the day. Cream Cheese of your choice at room temperature. I used Philadelphia Brand Chive Flavor, but plain or other flavors would work. I sometimes mix in a bit of shredded cheddar into the cream cheese to up the cheese factor. 2/3 of a package of high-quality bacon. 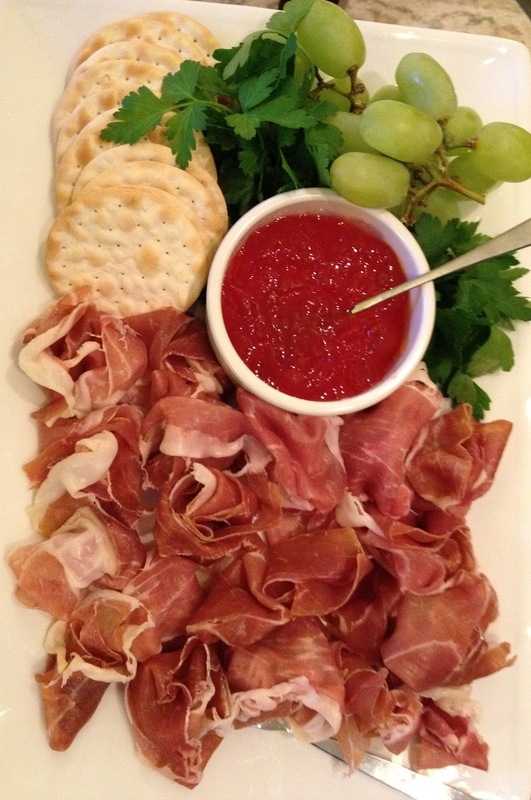 We love Coleman Natural Uncured Hickory Smoked Bacon. It’s cut a bit on the thicker side, which makes it extra yummy. Coleman products are also hormone free and humanely raised. I swear you can taste the difference. 24 plain toothpicks, soaked in water and patted until just damp. Spoon your cream cheese mixture into the jalapeno halves. You can use a damp paper towel to pretty up any overflow on the edges. Slide the bacon out of its packaging leaving it all in one block. Cut the bacon into thirds creating about 3 rows of approximately 3 inch lengths, long enough to wrap once around your jalapeno halves with a tiny bit of overlap. You may want to try cutting a single strip first to determine the best length. Wrap a strip of bacon once around the middle of the jalapeno, joining the ends underneath and overlapping slightly. Secure each with a toothpick piercing all the way through. Place poppers on a rack positioned over a baking sheet or pan with sides (in order catch any grease). Pop everything in the oven and cook about 20 to 25 minutes, or more if you like your bacon on the crispy side. Keep an eye on it to get it to your preferred doneness. I like mine less crispy. What in the world is a Pickle Back? A Pickle Back is a cocktail recipe – of sorts. I recently learned about it at a housewarming party hosted by my good friend Missy. She'd just enjoyed it at a New Year's party just a few weeks before. The Pickle Back is really a shot, a curious shot, which includes a healthy helping of pure pickle juice straight from the jar as a chaser to a stiff nip of whiskey. This two step combo shot purportedly originated at a dive bar in Williamsburg, Brooklyn. Assess your crowd before serving, as the mere suggestion of shooting straight pickle juice may sound odd to most. For me, the thought of gulping a large quantity of Jameson Irish Whiskey (the preferred Pickle Back spirit) was more daunting. As a drinker of lemon juice, vinegar, and lover of all piquant tastes, the pickle part was less far-fetched. That’s right, I’m the classy girl who will secretly slurp the remainder of a good vinaigrette from the bottom of my salad bowl, but only in the privacy of my own home, ideally. Pickle juice that has been strained of seeds – We used Kosher Dill Juice from the Vlasic Pickle Jar. One jar will get you about 8 shots. Fill half of the glasses with Jameson, and the remaining glasses with pickle juice. Each person gets a Jameson shot and pickle shot. At first, my guests were understandably leery, so I cooled my heels until they had a few more drinks and inhibitions went out the window. 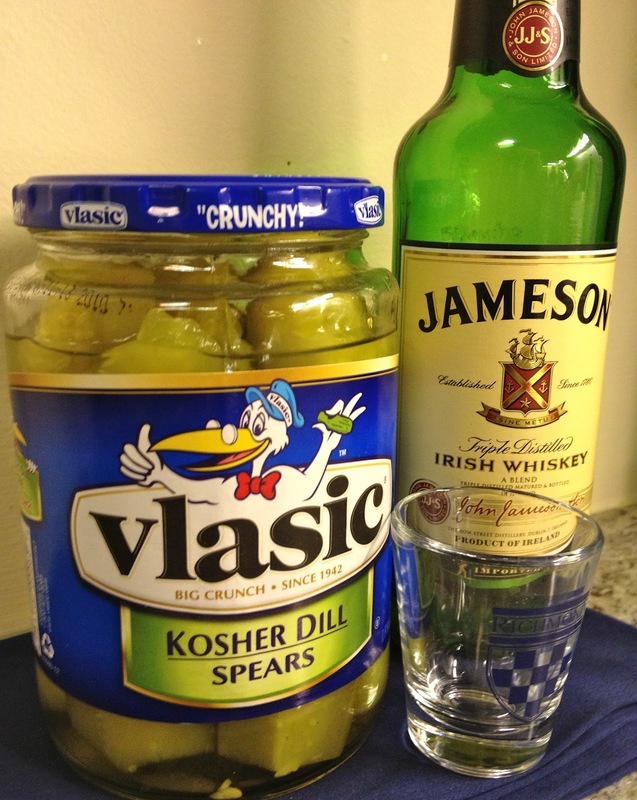 We then toasted the Giants and knocked ‘em back - Jameson first, pickle juice immediately after. Guess what? They liked it. The pickle juice totally erases the harsh traces of Whiskey on the palate, leaving you with just that pleasing vinegary taste. Jameson seems to be the preferred Whiskey for the Pickle Back, and here it did us proud. Next thing I knew, we were deciding who would head out for more pickle provisions. I recommend you give it a try!